The coalition, led by New York Attorney General Letitia James, contends that the U.S. Department of Agriculture’s (USDA) rollback of sodium limits and whole-grain requirements for school meals lacks legally-mandated scientific basis and in further violation of law, was adopted without public notice and opportunity to comment. “All parents want to know that their kids are healthy and will do anything to make sure they are. Low-income parents rely on healthy school breakfasts and lunches to help them with that. It’s one way they try like everyone else to afford their lives and live with dignity. 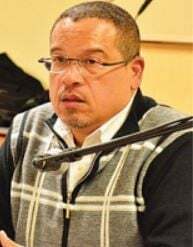 So it’s cruel that the Trump Administration would lower standards that could make low-income kids’ meals less healthy – and galling that they didn’t even follow the law in doing so,” Ellison said. In 2018, more than 600,000 Minnesota schoolchildren participated in the school-lunch program, and more than 200,000 in the school-breakfast program, with some children participating in both. In the United States, nearly 30 million school children consumed nearly 5 billion school lunch and more than 14 million school breakfasts. School meal programs are especially important for children in low-income families. In 2018, more than 74 percent of school lunches and 85 percent of school breakfasts provided to schoolchildren in the United States were offered free or at a reduced price. Further, according to USDA’s own figures, a disproportionately high share of students participating in the national school lunch and breakfast programs are African-American or Latino/a. In 2018, the Trump Administration, after soliciting no public comment as required by law, gutted a 2012 USDA rule setting updated nutritional standards for whole-grain and sodium content for school meals. By contrast, the 2012 rule was made after receiving more than 100,000 public comments. Ellison said the Trump Administration also failed to follow the law by stating how its changes were consistent with previously established dietary guidelines for school meals. Established in 1946, the National School Lunch Program is a federally subsidized program that provides students with meals in schools at low- or no-cost. Since that time, Congress has taken action to ensure that program’s nutritional guidelines keep current with the best scientific evidence with the most recent modernization occurring in 2010 with the Healthy Hunger-Free Kids Act. In 1994, Congress acted to require school meals to be consistent with the Dietary Guidelines for Americans, nutritional and dietary information, and guidelines for the general public that are jointly issued by USDA and the Department of Health and Human Services. In 2010, Congress directed USDA to update the nutritional requirements based on a 2009 study by the Food and Nutrition Board, which is part of the National Academy of Sciences. The Food and Nutrition Board study found that the daily sodium intake for schoolchildren “clearly was excessive,” and at levels significantly above the Dietary Guidelines. The study cited scientific evidence that showed a relationship between sodium intake and blood pressure in children as well, and that “high blood pressure responds to a reduction in salt intake in children as in adults.” Consequently, the Food and Nutrition Board Study recommended sodium limits for school meals based on the Dietary Guidelines. The study also found “extremely low” consumption of whole grains by schoolchildren. The study recommended grain products served in schools be “whole grain-rich” — i.e., contain at least 51 percent whole grains — as recommended by the Dietary Guidelines. Last year, according to Ellison and other state attorney generals, the Trump Administration’s USDA issued a rule dismantled key nutrition standards set by the 2012 Rule, such as eliminating the final maximum sodium target, delaying by five years the second intermediate maximum-sodium target that had been set for the 2019-2020 school year, and cutting in half the whole grains requirement. They say in issuing the rule, the Trump USDA failed to explain how the changes to the sodium and whole grain nutrition standards for school meals were, as required by law, “consistent with of the goals of the latest Dietary Guidelines for Americans” and “based on” the Food and Nutrition Board study’s recommendations. Further, the 2018 rule was neither issued as a proposed rule nor was the public provided an opportunity to comment on it. Joining Attorney General Ellison in the lawsuit are the attorney generals of California, the District of Columbia, Illinois, New Mexico, New York and Vermont. The lawsuit was filed April 3 in U.S. District Court for the Southern District of New York.